In the air, on land, and sea. We tend to think of films illustrating the pity of war as a very modern invention. One is drawn to the opening sequence of Saving Private Ryan, with its slick editing and lives cheaply thrown away on the Normandy beaches as the ultimate statement. Or how about the Oliver Stone directed Vietnam movies and their visceral, angry message making? But it’s not the case, of course. Hollywood has been making features carrying an anti-war message for as long as it’s been in business. The director of Halls of Montezuma, Lewis Milestone, scored a considerable hit and won Oscars for his 1930 entry, All Quiet on the Western Front, a powerful piece of work about the horrors of the western European trenches during World War One, told from the perspective of ordinary German soldiers. Perhaps the message of these films got a little lost when the cinema of war became all about the action adventure, the sight of Clint Eastwood joyously gunning down countless oncoming Nazis in Where Eagles Dare that drowned out the pacifist message told elsewhere. Halls of Montezuma was billed as a paean to the glory and endeavour of American marines, fighting in the Pacific Theatre during the Second World War, but it’s a far more complicated work than that. True, there are successes as the Japanese (in a sign of the times, they’re referred to constantly as ‘nips’) are pushed back, the film showing an example of how that happened. But there’s also a toll, an ever present price to pay, as the men commanded by Lieutenant Carl Anderson (Richard Widmark) are decimated, and not for the first time. The routine story of the marines’ efforts to take a Pacific island from their enemies becomes a highly personal tale, vignettes that explore their lives away from the front giving us a precious insight into their characters, their hopes and fears. Anderson was a Science teacher before enlisting, and helped a student (Richard Hylton) to overcome his debilitating stutter. Years later the kid, Conroy, is in Anderson’s platoon, but struggles with panic attacks about going into battle, forcing the pair to remember their previous encounter. To his men, the Lieutenant might appear to be a stolid commander, yet he suffers from terrible migraines, and ‘Doc’ (Karl Malden) holds the tablets that will help him, which makes him recall when he first took on the job of dispensing them. The difficulty of each mission is made clear to the men as they disembark from their ships and make for the beaches in their landing crafts. They look ruefully back at the relative safety of the ships receding into the distance, before the guns open up to clear their passage onto the shores. Everyone knows the Japanese are tough fighters. What they don’t know is whether they’ll make it back off the island, and the film shows their acknowledgement of this horrible reality. Once on land, the job takes on extra levels of impossibility as the marines come under attack from a hidden missile silo. Their only chance of success is to discover the location of the base and order the aircraft to destroy it; otherwise their attack will be halted. The plot takes in the interrogation of captured Japanese soldiers, daring incursions into enemy territory and the deaths of much of Anderson’s platoon. That he survives and indeed prevails is presented as a bittersweet notion, not only for him but also Jack Palance’s cynical Pigeon Lane, who’s faced up to death many times and despite protecting the redneck private, Pretty Boy (Skip Homeier), is unable to save him. In Halls of Montezuma, war is hell, a necessary hell but always a struggle against the conditions, enemy soldiers and internalised stresses. It foreshadows the HBO mini-series, The Pacific, with its sobering look at what life at the front was really like, and serves as a neat counterpoint to the number of Film Noir entries being made at the time. It’s very easy to imagine Widmark’s emotionally wrecked Anderson as a Noir character once he returns home, wrestling with the guilt of all those dead comrades that he’s doomed to bear for the rest of his life. 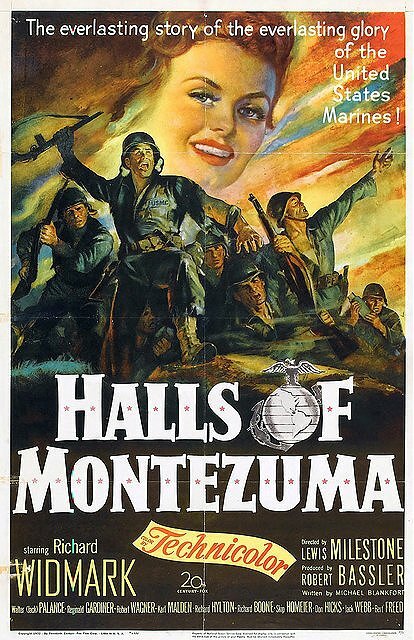 Halls of Montezuma was a lavish production, utilising the co-operation of the United States Marine Corps and filmed in and around Camp Pendleton, which remains the USMC base just outside San Diego. The filming of battle scenes was compiled with stock footage of actual landings, which jars a little now as the ‘joins’ are obvious but was standard practice at the time. Its focus on the people rather than the action makes for refreshing viewing, its message of real lives being spent on strategically important spits of land coming across very powerfully, its values writ large. Amidst a good cast, I was impressed strongly with Widmark’s performance. Here playing the film’s hero, he nevertheless managed to develop a complex, multi-dimensional character rather than a straight, square jawed lead, clearly feeling every casualty for which he feels responsible. It#s a surprisingly good and gritty movie, with nice characterization and typically strong direction from Milestone. Widmark is, of course, excellent but he could hardly put a foot wrong at this stage in his career. Thanks Colin. Widmark impresses me more and more with his performances at this time. His cowardly rogue in NIGHT AND THE CITY is nigh on a perfect noir character for me. I agree, and he just got better and better as the decade wore on. He moved more into westerns in those years and delivered one top performance after another: Garden of Evil, Broken Lance, Warlock and The Law and Jake Wade. Thanks Sergio – can’t win ’em all, I guess, and despite liking it I didn’t think this was as good or as angry as ALL QUIET ON THE WESTERN FRONT, which seems like a very brave film choice to make in hindsight.